Despite a turbulent economy, attendee preregistrations for the 94th Scientific Assembly and Annual Meeting of the Radiological Society of North America (RSNA) were up from 2007. Held from November 30 to December 5 in Chicago, IL, this year's meeting saw an increase in the number of first-time exhibitors. Throughout the exhibit hall, vendors had a similar theme: Help customers become more productive while giving them tools to cost-effectively expand their clinical service lines and improve the patient experience. Vendors continued to demonstrate a commitment to women's health, with advancements seen in all areas from modalities to accessories to informatics. Computed tomography (CT) radiation dose exposure also remains a critical issue for manufacturers. 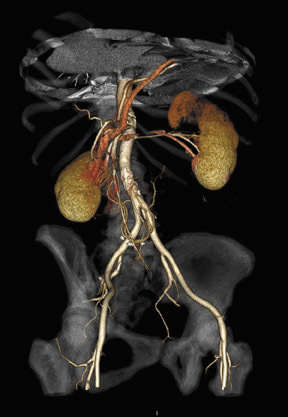 Additionally, with the rise of massively multislice CT procedures, the need for advanced visualization technology has created opportunities for several new companies to unveil innovative solutions for medicine's biggest computing challenges. Picture archiving and communications systems (PACS) and other informatics vendors exhibited tools to improve productivity, and "interoperability" continued to be a major buzz word as companies look for solutions to manage multiple PACS worklists, databases, and user interfaces. Aurora Imaging Technology, Inc. (North Andover, MA) highlighted two new advancements on its 1.5T breast magnetic resonance imaging (MRI) platform: AuroraSPECTROSCOPY and AuroraEDGE. AuroraSPECTROSCOPY allows users to perform in vivo breast MR spectroscopy. AuroraEDGE is a pulse sequence and image acquisition system that minimizes the effect of cardiac and respiratory motion. The result of this new technology is the production of pristine anatomic detail of the axillary tail, axillary nodes, chest wall, and mediastinum. Dilon Technologies, Inc. (Newport News, VA) promoted the clinical utility of Breast-Specific Gamma Imaging (BSGI). Several physicians presented promising results when using BSGI as an adjunct to traditional breast imaging methods such as mammography, MRI, and ultrasound. According to the research presented, BSGI is emerging as a cost-effective adjunct imaging mo-dality for breast cancer diagnostics. Dilon also an-nounced a comarketing partnership with PenRad Technologies, Inc. (Minnetonka, MN) for the company's mammography information system (MIS). Dilon will introduce the PenRad MIS to its Dilon 6800 Gamma Camera customers to streamline patient examination analysis and reporting. FUJIFILM Medical Systems USA, Inc. (Stamford, CT) spotlighted its integrated solution for women's health, which includes radiology information system (RIS), PACS, and cardiovascular and women's imaging products. Fuji now delivers Web-based access to all mammography and cardiovascular images and information, as well as access to all RIS data and reports, from one workstation, with a single sign-on and familiar user interface. Together, Synapse Radiology, Synapse Women's Imaging, Synapse Information Systems, and Synapse Cardiovascular provide a complete imaging and informatics platform to support the needs of enterprise imaging. Fuji also announced a work-in-progress digital radiography (DR)-based full-field digital mammography (FFDM) system with a dual-layer amorphous selenium (a-Se) DR detector. GE Healthcare (Waukesha, WI) added the Image Diagnost acquisition workstation to supplement its Seno Advantage Workstation. Image Diagnost supports multivendor reading of FFDM images and the ability to easily transmit information from multiple imaging sites to one central reading hub. For PACS users, GE also presented the next release of the Centricity PACS mammography module, which is designed to meet the needs of customers who are reading multimodality images in large multicenter facilities. The release incorporates a specialized toolset for digital mammography within PACS. GE also released the Senographe Essential Interventional, an add-on digital stereotaxy option on the Senographe Essential digital mammography platform. Invivo Corp. (Orlando, FL) showcased Luminescence, an advanced breast MRI coil system. The Luminescence coil comes in 8-, 16- and 32-channel versions. The system is available with both interventional coil and an optional 16-channel diagnostic coil. Philips Healthcare (Andover, MA) showcased its portfolio of women's health solutions, which includes the MammoDiagnost DR (not available in North America), the iU22 Breast Ultrasound, the MR Elite Breast, the GEMINI TF Big Bore positron emission tomography/CT (PET/CT), and iSite PACS. The company also previewed its 510(k)-pending MammoDiagnost VU workstation. The unit is a stand-alone workstation that enables multivendor hanging protocols and is able to automatically align left and right breast tissue according to the specified hanging protocol. Siemens Healthcare (Malvern, PA) showcased their women's health products, including the MAGNETOM Espree Pink, a dedicated MR breast scanner that combines the open-bore design of the MAGNETOM Espree with the Sentinelle Vanguard for Siemens (Sentinelle Medical Inc., Toronto, Ontario), a breast coil solution that offers biopsy access. Siemens ACUSON S2000 Automated Breast Volume Scanner (ABVS) system automatically acquires full-field sonographic volumes for comprehensive review and diagnosis of the breast-streamlining workflow and reducing operator dependence and variability. In mammography, the MAMMOMAT Novation DR digital mammography system with a large-format 24 × 29-cm detector features Siemens' dual-anode technology. Toshiba America Medical Systems, Inc. (Tustin, CA) announced its Radiance Plus Breast Imaging Suite, which is available on the Vantage Atlas and Vantage Titan MR systems. The bilateral, dedicated, multi-element Radiance Plus Breast Imaging Coil provides high temporal and spatial resolution for dynamic analysis and lesion characterization. In ultrasound, Toshiba an nounc ed the MicroPure breast ultrasound technique, which can help physicians detect breast lesions and microcalcifications. Toshiba also showcased a new 18-MHz high-resolution Dynamic Micro Slice transducer for breast imaging as well as a quantitative sonoelastography suite called ElastoQ. ElastoQ is a work-in-progress noninvasive medical imaging technique that evaluates tumors based on their stiffness. iCAD Inc. (Nashua, NH) demonstrated its SpectraLook and CADvue products for breast MRI. SpectraLook breast MR analysis creates colorized images based on signal changes defined by tumor physiology. iCAD's All Time Point (ATP) analysis is based on an advanced phar-maco-kinetic model that calculates numerical values of key physio logical parameters, which helps the user detect biological processes taking place in malignant versus benign tumors. CADvue image review and analysis software facilitates the analysis of ATP colorized images and quantitative data. Toshiba America Medical Systems an-nounced that it will support CORE 320, a worldwide multicenter trial comparing the effectiveness of 320-detector-row dynamic volume CT to single-photon-emission CT (SPECT) technology. The trial will examine whether the combination of CT angiography and myocardial perfusion can identify coronary stenoses that are ≤50% by quantitative coronary analysis and correspond to a SPECT perfusion defect. CORE 320 began in December 2008. Siemens Healthcare released the SOMATOM Definition Flash, a dual-source CT, featuring 2 X-ray tubes that simultaneously revolve around the pa-tient. 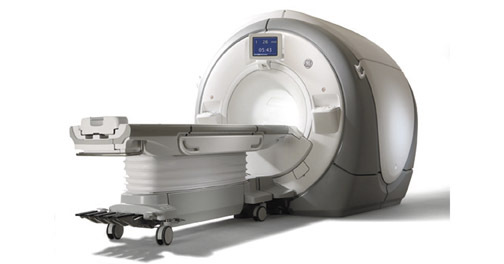 This model offers a 43 cm/sec CT scanning speed and a temporal resolution of 75 milliseconds. The short scan times provide scans of the entire chest in 0.6 seconds, which means that many examinations can be performed without a breath-hold. With the SOMATOM Definition Flash, a spiral heart scan can be performed with <1 mSv, whereas the average effective dose required for this study usually ranges from 8 to 40 mSv. Philips Healthcare unveiled the 510(k)-pending MX 16-slice CT. The MX 16-slice CT is targeted at customers who want to replace their current scanner or add a second system at an economical price point. The MX 16-slice CT can perform examinations including CT angiography, dental planning, and virtual colonoscopy. Philips also added a 128-slice scanner to its Brilliance iCT platform. The Brilliance iCT Scalable Platform can be sited in a room as small as 365 square feet, and it can be upgraded to 256 slices as the facility needs change. The iCT platform features a rotation speed of 0.27 seconds and a power of 120 kW. GE Healthcare made 2 major CT an-nouncements at RSNA: the Discovery CT750 high-definition (HD) low-dose CT scanner, and the LightSpeed VCT XTe configuration, a low-dose evolution in the LightSpeed VCT line. The Discovery CT750 HD features a Gemstone detector and HD reconstruction technology. The Gemstone detector uses a new CT scintillator based on a garnet gemstone. The scintillator offers a technique called Gemstone Spectral Imaging, which enhances tissue characterization through its ability to derive images that separate materials such as calcium, iodine, and water. GE noted that the LightSpeed VCT XTe uses HD reconstruction to enable dose reductions up to 40% in routine imaging with no loss of image quality. GE Healthcare received U.S. Food and Drug Administration 510(k) marketing clearance for its new 1.5T MR scanner, the Discovery MR450. The Discovery MR450 is designed to provide real-time cardiac imaging, single-acquisition multicontrast abdominal images with outstanding fat/water separation, and ultra-high-resolution musculoskeletal examinations with high patient throughput. GE also announced several new applications for its 3T Discovery MR750 system (Figure 1), including SWAN (T2*-weighted angi-ography). SWAN combines a 3D T2*-based multiecho acquisition with a special reconstruction algorithm. The company reports that the application yields a submillime-ter-resolution 3D image that integrates a broad range of distinct tissue contrasts with enhanced susceptibility information and a greatly increased signal-to-noise ratio. Hitachi Medical Systems America, Inc. (Twinsburg, OH) now offers its 1.5T Echelon in either 8-channel or 16-channel configurations. The Echelon XL delivers high-field clinical utility and advanced capabilities with an 8-channel radiofrequency (RF) system that can be upgraded to 16 channels. The Echelon XLS includes the 16-channel RF system. Echelon systems employ powerful 33/150 gradients, HOAST for uniform RF fat saturation even in large field-of-view imaging, RADAR motion compensation for comprehensive free-breath-ing abdominal studies, and RAPID parallel imaging for faster dynamic imaging. Invivo Corp. released the sixth generation of its Precess Patient Management Configuration for monitoring MRI patient vital signs. The system uses wireless technology to monitor electrocardiographic and saturation of peripheral oxygen (SpO 2 ) vital signs. MagResource LLC (Green Bay, WI) announced that it will support the new American Society of Testing and Materials (ASTM) safety standards for MRI implant devices. MagResource will display the new ASTM classifications of "MR Safe," "MR Conditional," and "MR Unsafe," with database search results in the near future. This will allow users to observe whether the MRI status displayed is the new ASTM standard or the old standard, which used the terms "MRI Compatible" and "MRI Safe." Philips Healthcare introduced the Achieva 3T TX MRI with MultiTransmit RF management. This new proprietary multichannel RF transmission technology automatically adjusts its RF signal to a specific patient's anatomy. The result is higher acquisition speed, better image quality, and more consistent imaging results, according to the company. Philips also unveiled the Achieva SE line, which is an extension of the Achieva 1.5T platform. The Achieva SE is designed to offer high-performance imaging, with lower operating costs, and a compact siting. Achieva SE uses the same basic platform as the Achieva 1.5T A-Series. 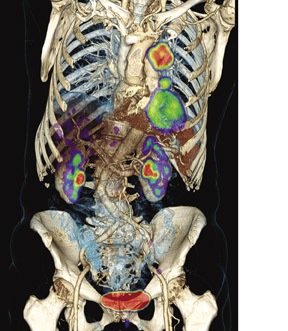 Siemens Healthcare released new MRI oncology applications with Tim (Total imaging matrix) technology. The syngo TimCT Oncology product provides continuous table movement for extended field-of-view imaging and comprehensive staging; for example, a pelvic examination can be completed in as little as 20 minutes. The manufacturer also notes that syngo TimCT Oncology reduces the need for rescheduling multiple examinations on other modalities by offering a complete examination on a single system. With syngo Tissue 4D (4-dimensional), users can perform a dynamic evaluation with quantification of tumor tissues in organs, such as the prostate and liver. Toshiba America Medical Systems announced a the 700th installation of the EXCELART Vantage MR system at Comanche County Medical Center (CCMC) in Comanche, TX. The system is designed to increase patient comfort without compromising image quality or diagnostic capability. CCMC acquired Toshiba's Vantage Atlas MR system, which it will use for general MRI and breast MRI. The CCMC staff selected the Vantage based on specific features, including Pianissimo quiet gradient technology, which can reduce MR noise. FiatLux Imaging Inc. (Redmond, WA) exhibited FiatLux Visualize, an innovative 2-dimensional/3-dimensional (2D/3D) reconstruction application that uses Microsoft's DirectX programming protocols. The software is available for purchase for <$3000, and it runs on off-the-shelf desktop and laptop computers with standard graphics cards. FiatLux Imaging and Philips FIMI, a provider of medical displays and mobile point-of-care terminals, also announced plans to demonstrate 3D imaging at the point-of-care using FiatLux Visualize on the handheld Philips CliniScape mobile clinical assistant. GE Healthcare spotlighted the Advantage Workstation (AW) Server, which provides advanced visualization features on computers in a clinician's home or practice. With the AW Server, radiologists, technologists, and referring physicians can review and share images out side the office. The AW Server also allows users to create custom worklists for individual reading styles. They can access prior examinations from that worklist and use any postprocessing application from the PACS reading station. Sapheneia (Ventura, CA) showcased its Clarity CT module, which provides image optimization and lower radiation dose protocols during CT data acquisition. The Clarity CT Solution is reported to reduce radiation dose by 20% to 80% depending on anatomy and to improve the visibility of anatomic structures in CT images that are obtained at ultra-low radiation exposure levels. According to the company, the technology also can increase the image quality for the examination of obese patients, as the X-ray generator alone often cannot yield high enough exposures to generate good-quality data for this patient population. SharpView AB (Linköping, Sweden) spotlighted its software solution designed to lower the radiation dose in conventional CT procedures from 30% to 70% while preserving the image quality. The dose reduction comes as a result of an adaptive, nonlinear, filter-based mathematical algorithm that resembles the human vision system. The software analyzes each part of the picture and removes random noise. This makes it possible to get sharp images even at a low radiation dose. TeraRecon, Inc. (San Mateo, CA) ex-hibited its Aquarius iNtuition thin-client, server-based solution for ad- vanced visualization. The company announced that iNtuition, which supports the TeraRecon PACS application programming interface, can be contextually launched from within the worklists of numerous PACS vendors. TeraRecon also announced a flexible licensing program called iNtuition UNLIMITED. The licensing program provides institutional informatics teams with unlimited access to Aquarius iNtuition software assets. Vital Images, Inc. (Minnetonka, MN) launched Vitrea Web, a new solution for Vital Enterprise customers that provides Web access to all of Vital Images' clinical applications. With Vitrea Web, customers have the capabilities of a stand-alone workstation from any PC (Figure 2). Vital Images also announced that the company re-newed a distribution agreement with Toshiba America Medical Systems. Toshiba will offer Vital Images' Vitrea solution through subsidiaries and distributors in more than 50 countries. Agfa HealthCare (Greenville, SC) showcased IMPAX Scheduling, its Web-based enterprise scheduling and planning product. This real-time, Web-based application manages imaging study orders, patient appointments, and resources. Agfa also presented the IMPAX Data Center, which provides large-scale multimedia storage for all types of medical images and diagnostic results. The system consolidates the data from disparate systems into a single point of storage to serve the data needs of the enterprise. BRIT Systems Inc. (Dallas, TX) demonstrated its Web-based Roentgen Works remote reading solution that is designed to allow radiology groups to provide outsourced reading services. Brit also debuted the Roentgen Files II, a DICOM server that uses a Google database and Linux clustering technology to create an image management and distribution solution. BRIT also announced that technologies such as AJAX and Skype would be available with Roentgen Works as embedded applications. AJAX enables real-time updating of information and viewers in an intelligent fashion. Skype lets users communicate over the Internet through instant messaging or phone calls that are logged and tracked. Carestream Health, Inc. (Rochester, NY) unveiled its SuperPACS Architecture, which is designed to integrate multivendor, multisite PACS into an enterprise solution. Currently a work-in-progress, the SuperPACS Architecture communicates with legacy systems to create a common global worklist and applies intelligent rules to balance workload and to route studies. Carestream also introduced a new Web-based CARESTREAM RIS that uses a Microsoft.NET architecture, which is designed to offer flexibility and scalability in a thin-client solution. Compressus, Inc. (Washington, DC) presented its interoperability product, MEDxConnect version 2.5, which was recently installed at Seattle Radiologists APC (SeaRad). The system acts as a single enterprise-wide worklist solution, integrating digital imaging and data management systems at multiple SeaRad sites. At SeaRad, Compressus enables enterprise-wide monitoring, voice capability, report distribution options, and HL7 and DICOM integration. Emageon Inc. (Birmingham, AL) featured its new Outside Study Gateway (OSG), which enables outside facilities to perform direct DICOM transmission of their PACS images to the receiving hospital's OSG server. This transmission includes automatic patient information and examination integrity checks. It also enables autoforwarding into the receiving hospital's enterprise PACS. FUJIFILM Medical Systems USA demonstrated Synapse PACS Version 4.0. This version offers the Communication Accelerator, a tool set that enables full compliance with the Joint Commission on Accreditation of Healthcare Organizations (JCAHO) Guidelines and the American College of Radiology (ACR) Practice Guidelines for Communication of Diagnostic Imaging Findings and Peer Review. In addition, Synapse Version 4.0 features enhancements to the Synapse 3D suite of ad-vanced visualization tools. Fuji also displayed the integration of Synapse PACS and Encompass.NET RIS, which provides a single view of the radiology department from the RIS homepage. GE Healthcare released Version 3.0.6 of its Centricity PACS. The version features the Web DX diagnostic viewer, which allows radiologists and specialists to quickly access clinical toolsets such as advanced visualization and mammography from virtually any location. Centricity PACS 3.0.6 also enables enterprise connectivity with a single access point for all patient images, re-gardless of department or specialty. GE also introduced Centricity PACS-IW Oncology Workflow, an application for Web-based PET/CT functionality. Oncology Workflow brings PET/CT capabilities to the PACS workstation. Laitek (Homewood, IL) announced a Version 2 release of its Migratek Advanced Migration Services, which provide migration of archived DICOM and related imaging data. Version 2 uses Laitek's Rapid Migration technology to shorten the migration timeline during system transitions. The company reports that the Rapid Migration technology transfers data from a legacy PACS archive to the new image management system 5 to 10 times faster than competing solutions. Nuance Communications, Inc. (Burlington, MA) released Veriphy 3.0, a critical test result management solution that enables healthcare providers to comply with JCAHO requirements for communicating critical test results. Veriphy 3.0 automatically tracks provider-to-provider shared patient messages, indicates the severity of findings, and, through its notification and message delivery process, does not close the communication loop until a caregiver authorizes receipt of the message. Nuance also demonstrated RadPort for Radiology 2.0, a Web-based decision support solution for managing diagnostic imaging utilization. The system is intended to reduce potentially medically unnecessary ex-aminations by providing ordering physicians with an appropriateness score and an examination utility score at the point of service. 2.0 next-generation reading environment brings relevant clinical information, examination data, and images into a single view. Siemens Healthcare showcased syngo Portal Executive for the proactive management of issues relevant to executives and managers. Siemens also demonstrated syngo Portal Transcriptionist, which helps transcriptionists improve efficiency and accuracy when transcribing and correcting reports. Neither product is commercially available yet in the United States. Siemens also unveiled syngo Suite Essential, an information technology package for diag- nostic imaging centers that includes preconfigured software, hardware, storage, networking, and services. Viztek, Inc. (Jacksonville, FL) introduced its turnkey digital conversion package that combines its Opal-RAD PACS and an advanced Kodak computed radiography (CR) device. Designed to transform a practice from film-based workflow to full digital imaging, Viztek's new Opal-MD package combines enterprise level Opal-RAD PACS for digital image viewing and management with Kodak's point-of-care CR. It is designed to offer an affordable solution for private practice physicians. ZONARE Medical Systems Inc. (Mountain View, CA) released the z.one ultra system-a high performance echocardiography solution. The system provides advanced color and spectral Doppler imaging, new transesophageal echocardiography capabilities, and a comprehensive calculations package. Users can now perform left ventricle analysis and assessment of valvular pathologies. In addition, advanced color and spectral Doppler applications help physicians to more accurately assess overall cardiac function. The system features 1-button image optimization and continuous focusing, which reduces keystrokes needed to optimize the study. Toshiba America Medical Systems, Inc. announced upgrades for its Xario XG ultrasound system. Differential Tissue Harmonic Imaging (D-THI) is now available on the Xario XG system. Exclusive to Toshiba, D-THI is a pat-ented nonlinear technique in which a dual-frequen-cy pulse is emitted, which results in uniform imaging for both superficial and deep structures and anatomy. Toshiba also announced additional features that will be available as part of a volume imaging package, including Spatio-Temporal Image Correlation (STIC) and Cavity Imaging. Using STIC, data is acquired via an automatic volume acquisition capturing a high number of 2D frames in a volume set. 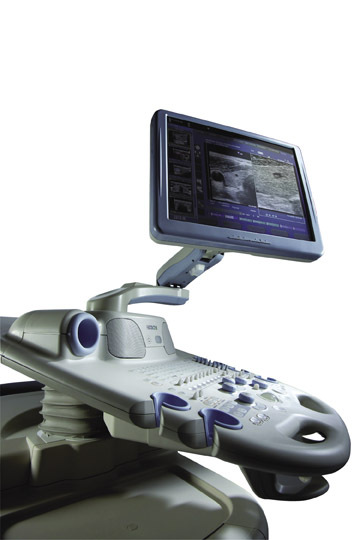 Philips Healthcare released Vision 2009, which is the fourth major upgrade to its iU22 premium ultrasound platform. The Philips iU22 system now offers tissue aberration correction on breast transducers to compensate for speed-of-sound variations of dense tissue, which is said to improve detail resolution and conspicuity of lesion details. Other upgrades include imaging presets for difficult-to-image obstetrical and gynecological applications. Philips also announced several new transducer developments. They cited recent studies that have reported superb image quality of Philips C5-1 PureWave transducer on the iU22 and have shown a reduction in failed ultrasound examinations by as much as 69%. Hitachi Medical Systems America exhibited the HI VISION 900 and the HI VISION 5500. The HI VISION 900 uses Hitachi's Real-time Tissue Elastography (E-mode) feature, which is being used for applications other than breast imaging. Hitachi's new Strain Ratio tool allows radiologists to quantify the relative differences in stiffness between a mass and any surrounding tissue. The company also displayed the HI VISION 5500 ultrasound system with a Version 6 software upgrade that adds HI RES speckle reduction for cleaner images. The upgrade also includes HI Definition Tissue Harmonic imaging (HdTHI), a harmonic imaging mode that increases penetration and contrast resolution with a dual-band technique (Figure 3). GE Healthcare showcased the LOGIQ E9 ultrasound system, which fuses ultrasound with images from modalities like CT and MR. The system offers Volume Navigation, including image fusion, which combines the benefits of ultrasound imaging with the high spatial and contrast resolution of other modalities. It also offers a GPS-like technology to track and mark a patient's anatomy during the ultrasound examination. 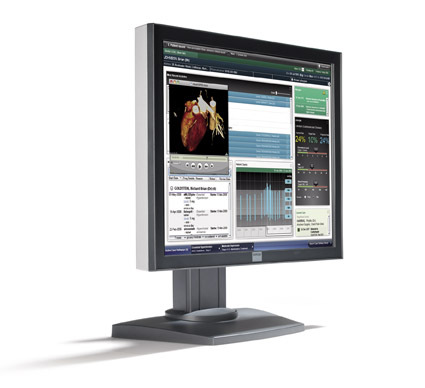 GE also introduced the LOGIQ e Breakthrough 2009, which combines clinical images and control capabilities on the same touch-screen user interface. Agfa HealthCare showcased the advanced DX-S system, which in-cludes DirectriX needle-based detector technology that is designed to increase image quality and offer X-ray dose reduction. The system also features Scanhead technology for reduced waiting times. According to the company, the DX-S is an alternative to direct radiography (DR) in environments where users need the flexibility and economic advantages of CR and the quality of DR.
Carestream Health, Inc. announced that the KODAK DIRECTVIEW DR 7500 System is now equipped with fully automated positioning and automatic image stitching, which eases workflow for long bone and spine examinations. It also eliminates the need for CR-based long-length imaging. This vertical imaging system can capture and stitch up to 5 exposures. Carestream also dem-onstrated a wireless, cas-sette-sized DR detector, the CARESTREAM DRX-1 System, as a work-in-progress. The new detector can be used in all applications that would use a 14 × 17-inch (35 × 43-cm) X-ray cassette. FUJIFILM Medical Systems USA, Inc. announced the commercial availability of the FCR Go portable digital X-ray system. The system features flexible and durable FCR cassettes that come in multiple sizes and are half the weight of DR panels. Fuji also exhibited the FDR AcSelerate DR system, which uses an amorphous selenium direct image capture technology. The company states that the increased thickness of the amorphous selenium layer allows the he FDR AcSelerate detector to provide higher sensitivity and better conversion efficiency with a detective quantum efficiency (DQE) 20% better than comparable detectors. Fuji also displayed the Unity- fp SpeedSuite, which is a new single-detector DR system that uses a cesium bromide detector to increase X-ray absorption and reduce scatter radiation. GE Healthcare launched the Discovery XR650 and the Optima XR640. The Discovery XR650 features GE's fixed flat-panel digital detector, which delivers a high DQE of 77% and high image clarity at low doses. Also new to the system, a portable detector offers greater flexibility in the radiographic room. The system is capable of several advanced applications such as Dual-Energy Subtraction and VolumeRAD imaging, which provide high-resolution slice images. The Optima XR640 is a digital fixed detector radiography system that provides the flexibility of a single shared digital detector. It features a moveable detector that mimics traditional patient examination workflow. Konica Minolta Medical Imaging USA (Wayne, NJ) showcased the FlexDR and the ImagePilot CR systems. The FlexDR is an upright, flat-panel DR system with an amorphous silicon and cesium iodide receptor. According to the manufacturer, it provides ultra-high DQE for high-quality images even with minimum X-ray exposure. The ImagePilot CR System with AutoPilot Image Processing optimizes image quality without the need to define and select image processing parameters for each body part and orientation. This simplified acquisition process uses a universal algorithm that keys on bone to create consistent, diagnostic-quality images. Philips Healthcare spotlighted its Eleva concept for radiography and fluoroscopy systems. Eleva is designed to provide a convenient and efficient workflow. Modalities based on the Eleva concept are intuitive and easy to operate, according to the company. Philips showed a 510(k)-pending Eleva Wireless flat-panel detector at RSNA. The detector's cable-free design could help healthcare providers maintain high hygienic standards and allow for convenient handling, even in critical environments such as the intensive care unit, trauma center, and the operating room. Siemens Healthcare introduced 3 new components to the AXIOM Luminos dRF: a wireless detector, a ceiling-mounted X-ray tube, and a new wall stand. The wireless detector provides the efficiency of a flat detector in the same coverage area as a 35 × 43-cm cassette. A new ceiling-mounted X-ray tube offers a color touch-screen user interface on the tube housing, so users can control the system without leaving the patient's side. Finally, the wall stand combines the wireless detector with classical operating features such as synchronized movement, portrait or landscape selection, and left- or right-hand detector access. Toshiba America Medical Systems, Inc. unveiled new options for the RADREX-i Dual Detector Radio graphic system, including an option for a mixed detector system (which is a work-in-progress) and auto-stitching capabilities. Toshiba's portable mixed detector option for the RADREX-i features 2 high-resolution detectors, a 17 × 17-inch fixed wall-stand detector and a removable 14 × 17-inch portable table bucky detector. The RADREX-i mixed detector solution is designed to provide the productivity of a dual-detector system with the flexibility of a portable detector system. Toshiba also exhibited the Kalare R&F system, which uses a high-resolution, removable, flat-panel detector. Viztek (Jacksonville, FL) unveiled its portable DR detector. The 14 × 17-inch portable unit integrates easily with most existing wall stands and table buckys without modification. The system delivers images in as few as 5 seconds. The Viztek DR panel is enclosed in a durable, lightweight shock- and water-resistant casing that weighs 8.6 lbs. The technology has 3.6 lp/mm with a 100% fill factor, which supports efficient collection of light and imaging information. Working with standard grids, the portable Viztek DR detector offers flexible positioning and is capable of upright, tabletop, and other special views. Barco (Kortrijk, Belgium) released a new line of clinical review displays. The MDRC product line is designed as a high-quality and budget-friendly visualization solution for a wide spectrum of applications. The MDRC series is avaible in 2 configurations: a 20-inch color screen with 2-megapixel (MP) resolution (MDRC-2120) and a 19-inch color version with 1-MP resolution (MDRC-1119). The latter can optionally be fitted with a touch-screen interface. Both models are equipped with professional-quality LCDs that present medical images with higher contrast and a wider viewing angle than conventional LCD screens (Figure 4). Bracco Diagnostics, Inc. (Princeton, NJ) showcased its expanded product portfolio, including contrast media and delivery systems. Results of the MR-ENHANCE study appeared in the American Journal of Neuroradiology . Researchers concluded that the higher relaxivity of Bracco's MultiHance (gadobenate dimeglumine) injection, 529 mg/mL, may be linked to greater signal intensity, better contrast enhancement, and better lesion conspicuity in MRI of the brain than is gadodiamide. 1 Bracco also displayed several contrast power injectors that are now part of the company's portfolio following Bracco's acquisition of E-Z-EM, Inc.
Carestream Health, Inc. announced a new tabletop low- to mid-volume laser imager that provides 508 pixels-per-inch output, an ideal resolution for mammography and general radiography. The company announced that the CARESTREAM DRYVIEW 5850 Laser Imager, currently a work-in-progress, will address the need for affordable laser-quality film output from FFDM and CR mammography systems. The imager, with 2 online film trays, will support DICOM printing for mammography and general radiography onto 5 film sizes. Codonics (Middleburg Heights, OH) demonstrated 3 products at RSNA: the Horizon 3-in-1 desktop imager (which produces dry film, color and gray-scale paper), the Virtua Medical Disc Publisher, and the Integrity Medical Disc Importer. The Horizon imager offers an ultracompact footprint that allows it to work on a desk or in mobile locations. The Virtua XR Medical Disc Publisher can record up to 60 CDs or 30 DVDs an hour. Integrity allows facilities to read, reconcile, and store medical studies from a disc into PACS. Konica Minolta Medical Imaging USA released the DRYPRO 873 laser imager. The imager offers a high silver ion capacity, an automatic density control function, and automatic calibration to produce sharp images. The solution is suited for digital mammography. The imager produces the first print in 50 seconds and can process 180 mixed film sizes per hour. NEC Display Solutions of America (Itasca, IL) added new monitors to its MultiSync MD line of high-brightness, color, and gray-scale flat-panel monitors. The new offerings include the 21-inch 2-MP MD212MC and the 21-inch 3-MP MD213MC color displays, both with front sensors. NEC also unveiled the 21-inch 3-MP MD213MG gray-scale display with front sensor. NightHawk Radiology Services (Coeur d'Alene, ID) showcased its complete line of solutions, including professional services, business services, and clinical workflow technology. The company exhibited its new offering, FinalsPLUS, which helps radiology groups with billing and collections as well as teleradiology services for preliminary interpretations and final reads. NightRays (Bellaire, TX) released the VidRay solution, which is designed to help create a live radiology consultation during a dictation session. VidRay allows radiologists to create consults when they are dictating a case. After dictation is completed, VidRay can attach the information to the radiology information system. Philips Healthcare announced that >50 facilities worldwide have implemented the Ambient Experience in a range of clinical environments. The Ambient Experience provides continuous support for patients during their entire experience within a department. It is designed to create a more comfortable and calming environment. The Philips Ambient Experience integrates architecture, design, and enabling technologies (such as lighting, sound, and video projection) to allow patients to personalize their environment to be more relaxing. Siemens Healthcare highlighted the new Biograph mCT hybrid imaging system. The system can render a whole-body PET scan in 5 minutes with ultraHD·PET technology. It also in-cludes the Adaptive Spiral CT technology found on the company's SOMATOM Definition AS scanner. The Biograph mCT has a field-upgradeable CT gantry that scales from 40 to 128 slices. Biograph mCT combines time-of-flight and point-spread-function reconstruction in a system that delivers 2-mm resolution throughout the entire field of view and 4× enhanced lesion contrast compared with standard PET scans (Figure 5). Sony Medical Systems (Park Ridge, NJ) showed a work-in-progress, FilmStation Mammography Film Imager (model UP-DF750). With a high-resolution thermal printing system and specially engineered blue thermal high- density film, the new printer is optimized for FFDM applications. Sony also showcased a new dye-sublimation printer, model UP-DR80MD. Targeted for full-page ultrasound applications, the new printer is the smallest full-page, medical-grade, dye-sublimation printer currently available; it measures 12.5 × 16.75 × 8.13-in and weighs 25 lbs. Rowley HA, Scialfa G, Gao PY, et al. Contrast-enhanced MR imaging of brain lesions: A large-scale intraindividual crossover comparison of gadobenate dimeglumine versus gadodiamide. AJNR Am J Neuroradiol. 2008;29:1684-1691. Nie B, Cheng WJ, Li YF, et al. A prospective, double-blind, randomized, controlled trial on the efficacy and cardiorenal safety of iodixanol vs. iopromide in patients with chronic kidney disease undergoing coronary angiography with or without percutaneous coronary intervention. Catheter Cardiovasc Interv . 2008;72:958-965. Technology Trends: More with less. Appl Radiol.